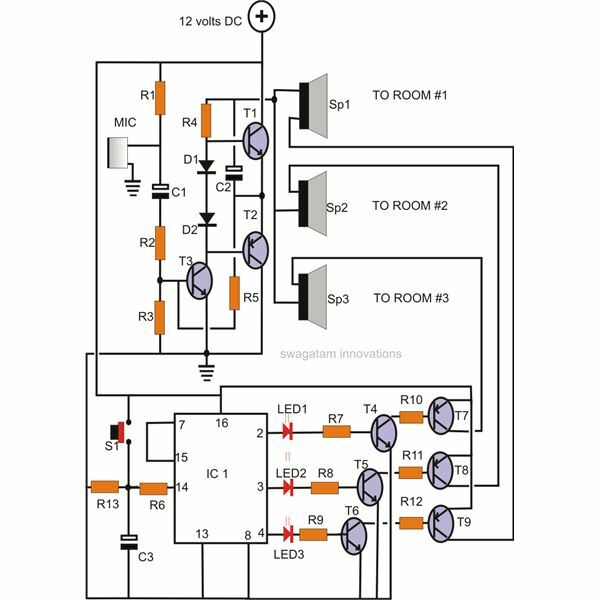 A few useful application circuits using IC LM317, collected from National Semiconductor's PDF datasheet are meticulously explained in this section with the help of the relevant circuit diagrams. All the circuits discussed below require an unregulated input voltage (max. 35 Volts) from any standard transformer/bridge/capacitor network. The most fundamental circuit that can be built using an LM317 IC is shown below. 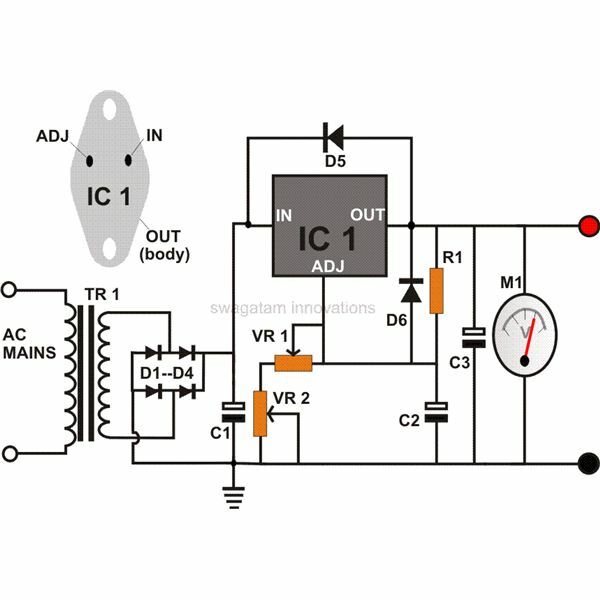 The IC incorporates just two resistors, one is the fixed reference resistor (R1) and the other one is a variable type for adjusting and receiving the desired voltage outputs. The maximum current here is limited up to 1.5 Amps. The set up becomes ideally suitable for all small power supply applications, the IC being featured with complete over voltage, short circuit, over load and thermal run away protections is free from all voltage related hazards and thus becomes a favorite with new electronic enthusiasts. The figure shows a standard LM317 wiring layout used for obtaining variable output voltages from 1.2 to the maximum supply input. 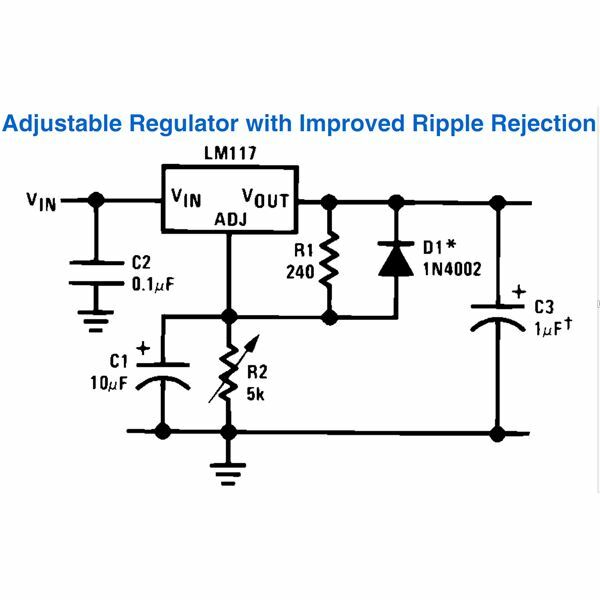 However the inclusion of C1, C3 and D1 helps to improve ripple rejection greatly and enhances the overall regulation of the circuit. C1 cancels out all possible ripple generations across R2 while it’s being operated and C3 filters out all residual ripple factors. In this configuration the voltage is fixed and clamped at 15 volts through appropriate selections of R1and R2. The inclusion of an extra transistor R3 and C1 makes it sure that the output of the circuit turns ON gradually after an input supply is applied. The output switch ON period will depend on the value of R3 and C1. Increasing the values will produce higher time delays and vice versa. The feature ensures safe surge protected switch ON of the preceding electronic circuit, becomes ideally compatible with high power amplifiers where a slow turn ON of the speakers becomes very crucial for avoiding sudden dangerous voltage "pops" in the speakers during power switch ONs. 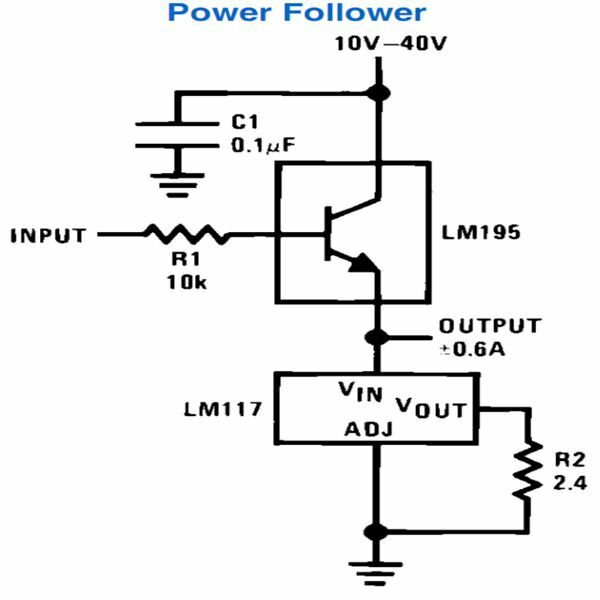 This is a very straightforward configuration using two ICs – the LM195 and LM317. 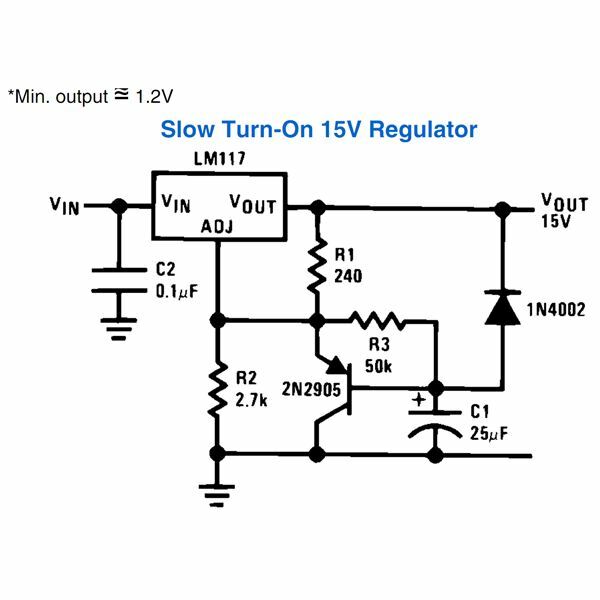 As the name suggests the function of the circuit is to act as a regulated buffer and reproduce exactly the same power which is being applied at the free end of R1. The output obtained from this circuit is overload and short circuit protected. An outstanding circuit can be built using LM317 IC along with Lm301 IC and a handful of other passive components. The parts wired around LM301 helps to generate variable outputs featuring constant voltage and constant current levels at the respective adjusted values. Voltage is varied through R8 while R2 takes hold of the current adjustment operations. The diodes are included for providing extra safety to the ICs. The power transistor MJ4502 in association with R1 and R3 act as current sensor and amplifier, with maximum current capacity of 5 Amps. For acquiring higher output currents, the transistor, R1 and R3 may be adjusted proportionately. The transistor may require a heatsink. Other equivalent values like TIP32C, MJE2955, etc. may also be tried in place of the shown transistor type. The application is best suited for building high end type power supply units with excellent specifications and as battery chargers for charging all types of lead acid or SMF batteries. The circuit is very simple yet promises huge application scope. 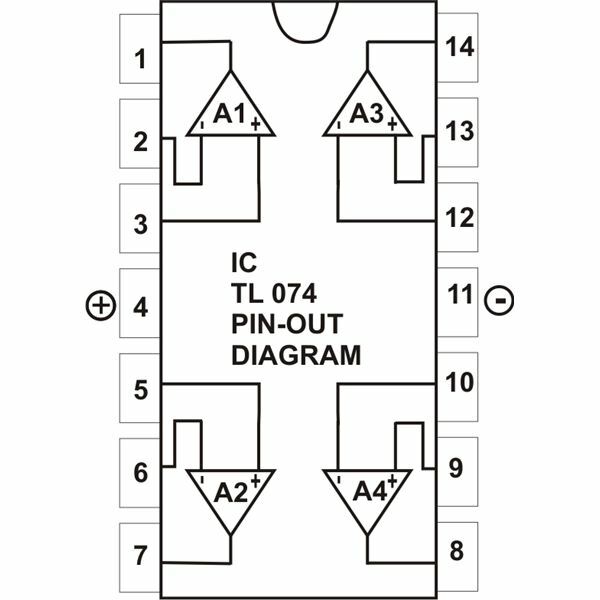 As can be seen in the diagram the IC LM317 hardly incorporates any external components, just a couple of them (C1 and R1) to be precise. 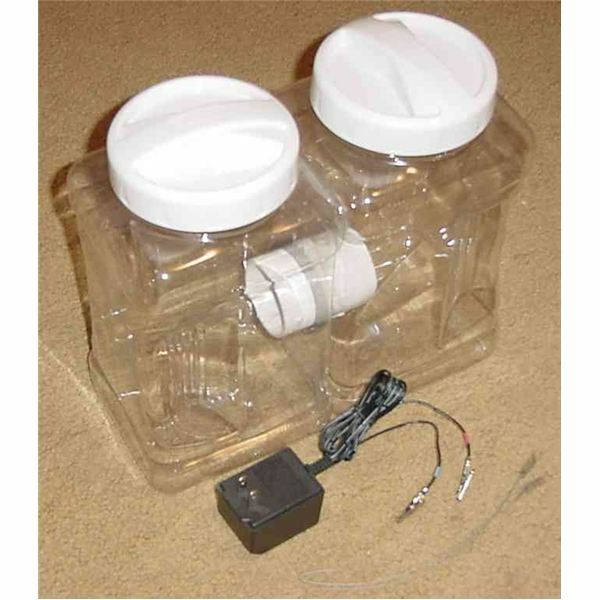 C1 ensures ripple filtration and smoothes the input DC. R1 is interestingly connected to the ADJ terminal of the IC so that its gets clamped with the released output current from the IC. This forces the IC’s internal circuitry to monitor and control the output current to a level determined by the value of R1. 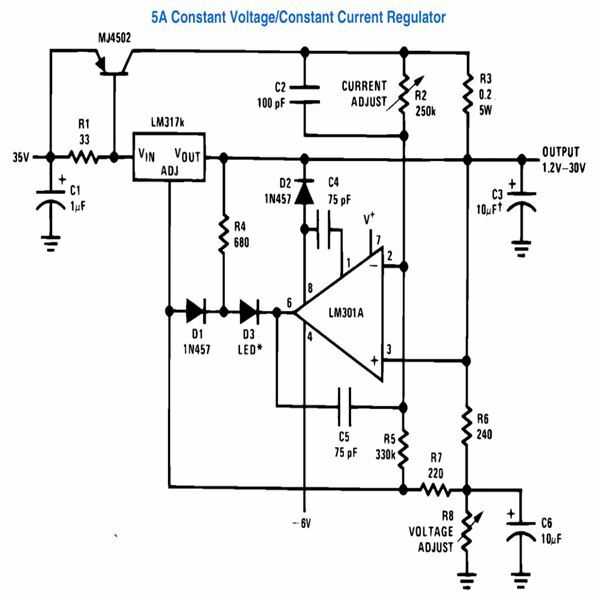 Here the value ensures that the output current cannot rise beyond 1 Amp. Other values can be appropriately and proportionately worked in place of R1 for getting other desired control levels of the output current. 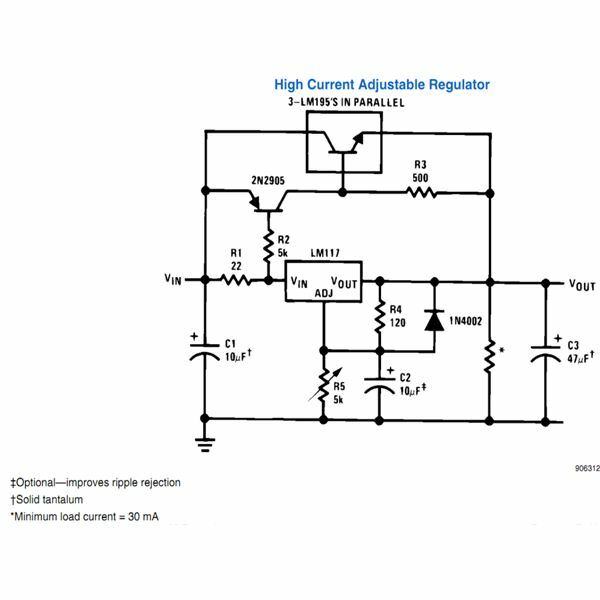 As the circuit is protected from invalid current levels, it becomes suitable for applications where operations at strict or critical current levels become imperative. 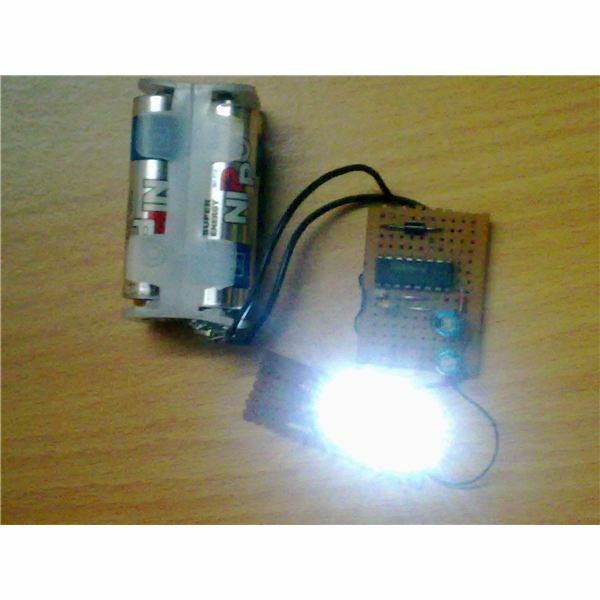 The circuit can be also be used for charging cell phone batteries (cell phones), automobile batteries, Ni-Cd batteries, for driving green pointer lasers, and for driving vulnerable high efficiency white LED lamps. 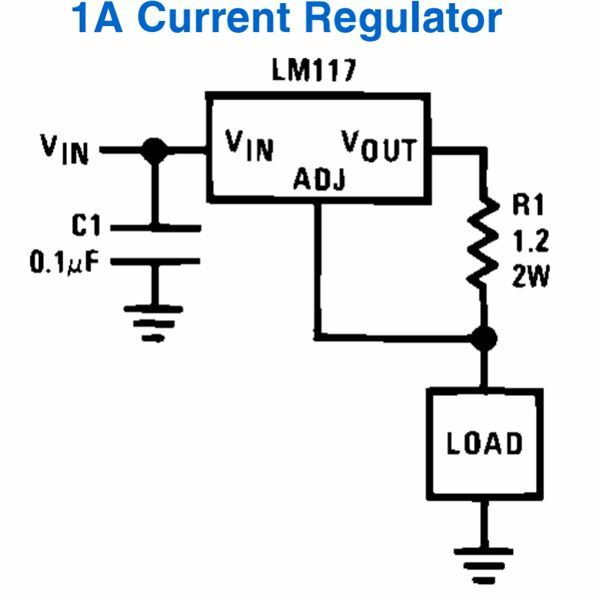 A very interesting modification in the standard LM317 circuit enables the circuit to monitor external dangerous situation and shut down the output of the regulator in response to the external relevant trigger. The circuit is configured to produce precise 5 volt output ideally suitable for all logic circuits (especially TTL circuits). The selected values of R1 and R2 here fixes the output to the required 5V, R2 may be altered with other relevant values for acquiring other desired output voltages, though. The transistor has been included specifically for the shut-down operation. 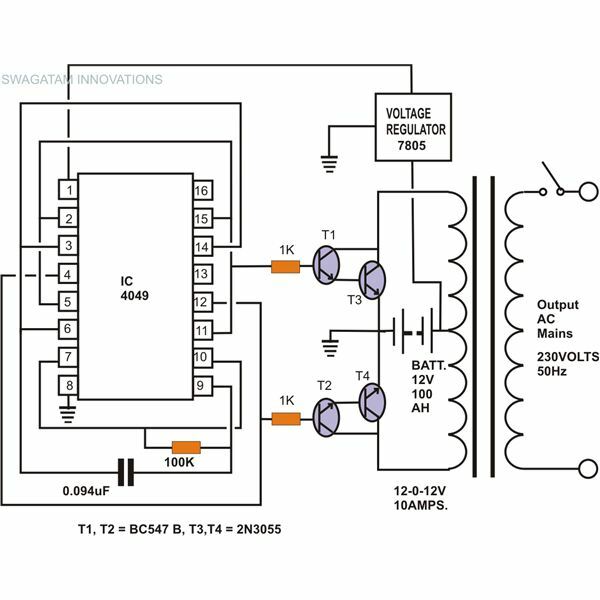 Under unfavorable conditions an external trigger switches the transistor into action which conducts and shorts R2 to instantly bring down the output to zero volts. 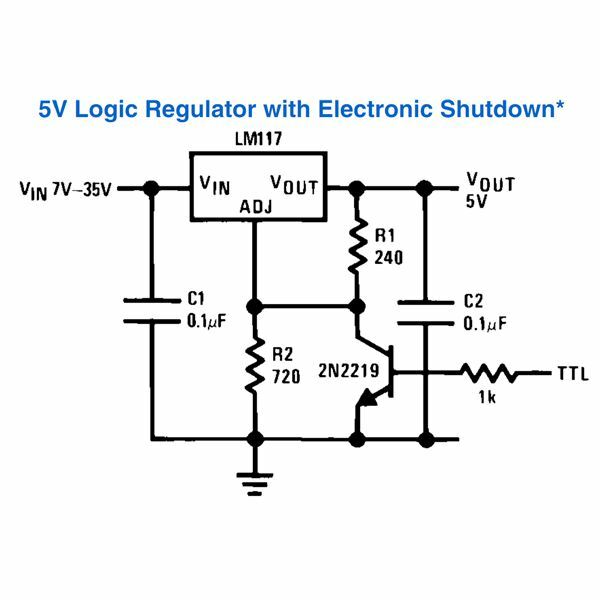 Since the circuit is equipped with the feature of switching off through an external trigger, becomes extremely suitable for many critical circuit allplications where fool proof shut down facilities are felt to be an absolute necessity. 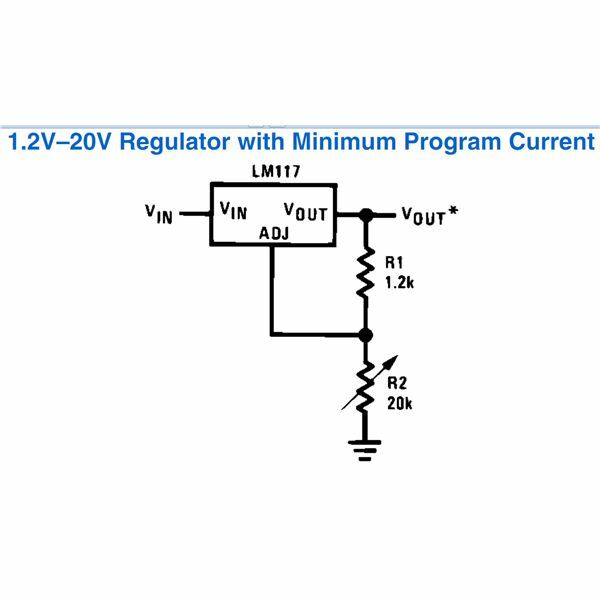 This configuration also provides the usual regulated, stabilized variable voltage output using LM317, however here the current output is immensely increased and thus becomes suitable with circuits involve huge currents at desired settable voltages. The transistor (as explained for one of the above circuits) is incorporated for allowing high currents at the output irrespective of the adjusted voltage, a group of ICs LM195 has been stationed for monitoring the current with the help of R3 and makes sure it doesn’t fall below a particular threshold determined by the value of R3. The maximum amount of current can be set by appropriately dimensioning the value of R1.